This may be silly because it questions some basic ideas from fluid mechanics. The “no-slip” condition of fluid mechanics tells us that waxing a sailboat hull is a waste of time. Could it be that this condition is wrong? Perhaps so. In recent years, there have been some experiments suggesting that hydrophobic surfaces (like wax) manage to produce less drag. 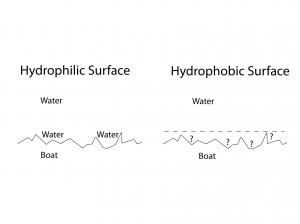 The picture suggests that there might be something different than ordinary water near the hydrophobic (water repellent) surface. One possibility is that tiny bubbles of air or water vapor inhabit the nooks and crannies of the surface. This is consistent with the observation that the reduced drag appears to be smaller on atomically smooth surfaces. There are more radical theories that say water could adapt a quasi-layered structure near the surface. Wax is not the most hydrophobic material. The reported experiments use compounds related to silane, which is methane with the carbon atom replaced by a silicon atom. In principle, a sailor should coat his boat’s hull with dimethyldichlorosilane to achieve maximum speed. This would probably be expensive. Two of many references are: Physical Review E, Volume 80, article 060601 published in 2009, and Physics of Fluids, Volume 16, page 4635 published in 2004. This entry was posted on Tuesday, May 24th, 2011 at 10:50 am	and is filed under Uncategorized. You can follow any responses to this entry through the RSS 2.0 feed. You can leave a response, or trackback from your own site.